Sister Anita Marie Zubay, CSJ, 84, died Sunday, February 8, 2015, in Villa St. Joseph in her 57th year as a Sister of St. Joseph. The daughter of the late Martin and Mary Cedzo Zubay, Sister Anita Marie entered the Congregation from St. Martha Parish in Leechburg, PA.
For more than thirty-five years Sister Anita Marie ministered as a teacher in the Dioceses of Pittsburgh, Altoona/Johnstown, Greensburg, and Reynoldsburg, OH, including six years at St. Bernard School, Indiana, PA and thirteen years at St. Joseph School, New Kensington, PA. Following her years in education, Sister Anita Marie served on the Congregational Archives staff from 2000-2008 where her accuracy and attention to detail were invaluable qualities. 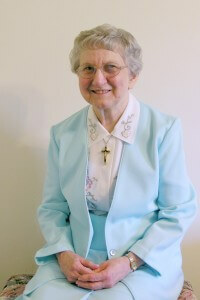 In 2008 Sister became a resident of Villa St. Joseph due to her declining health. Sister Anita Marie was an excellent teacher and loved by her students. She greeted others with her warm smile, and took great delight in singing and joining others in song. Sister touched the lives of others through her gentle presence, her zeal, and her kindness. Sister Anita Marie is survived by a brother, Martin of Hyde Park, PA and four sisters, Theresa Zubay, Anne Zubay, and Martha Zubay of Hyde Park, PA, and Elizabeth Scott of Leechburg, PA, , two nephews, one great niece, and two great nephews, and the Sisters of St. Joseph of Baden. Friends will be received Thursday from 1:00-8:00 p.m. and Friday from 11:00-2:30 p.m. at the Motherhouse of the Sisters of St. Joseph. Mass of Christian Burial will be offered Friday at 3:00 p.m. in the Motherhouse Chapel. Burial will follow in the Sisters’ Cemetery on the Motherhouse grounds. Donations in the name of Sister Anita Marie may be sent to the Sisters of St. Joseph Memorial Fund, St. Joseph Convent, 1020 State Street, Baden, PA 15005. Make a donation in memory of Sister Anita Marie.